The day started off with a fog that only gave a few yards of vision but as the morning dawned, the sun burned off the moisture revealing a sunny and hot day for the 2017 Battle of Britain Ceremony held at the Vintage Wings of Canada (WVoC) hanger at the Gatineau Executive Airport. This was the first year for the ceremony to be held at this venue, having been at the Canada Aviation and Space Museum for the past many years. It is appropriate, however, to have it at VWoC as they have a stellar collection of flying WWII aircraft. Among the distinguished guests were Ms. Tanya Sefolo, representing the High Commissioner of South Africa, Senator Joseph Day, Honourary Colonel of the Royal Canadian Air Force (RCAF) Loreena McKennitt, along with local members of Parliament and city councillors. The dignitaries included the Commander of the RCN, VAdm Ron Lloyd, Acting VCDS LGen Parent, the British High Commissioner to Canada, Her Excellency Susan le Jeune d’Allegeershecque, and the Commander of the RCAF, LGen Michael Hood as the Reviewing Officer. She also mentioned Canada’s contribution, not only in manpower for the fighter squadrons, but for our training of aircrew and our manufacturing of war goods, so that “… the RAF … ended the battle stronger than it went into it”. 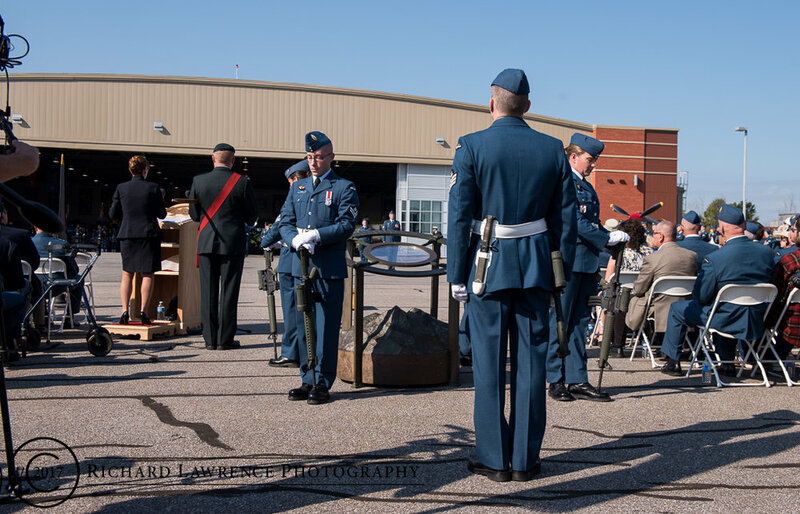 “… remember all of our airmen and airwomen, past and present, who served Canada and Canadians, at home and around the world, in the cause of freedom and security.”. After the march-off of veterans and troops, the Snowbirds, who had just completed a flypast, put on a show for the hundreds of people in attendance.